OPPO A71k is a Smart-exclusive version of the popular handset in the Philippines. 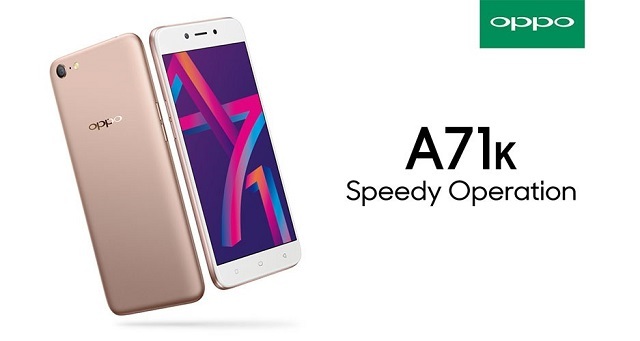 OPPO A71K is now released in line with the company's partnership with Smart. The handset will be exclusively sold in Smart stores nationwide at Php 5,988. For the purpose of comparison, the original OPPO A71 has a price tag of Php 8,990. The OPPO A71K comes with the same spec sheet as the standard OPPO A71. It packs 5.2-inch HD scratch-resistance display, and ticks with Qualcomm Snapdragon 450 chipset. Aside for the processor and display, the handset also comes with decent specs - 2GB RAM, 16GB storage and 3000 mAh battery. The OPPO A71K has a 13MP sensor with f/2.2 lens aperture and 5MP selfie camera with f/2.4 aperture lens. The latter is powered by AI Selfie Recognition tech. A Smart LTE SIM will be bundled with the handset. You can get it in Smart and TNT stores nationwide.